Chris Holland - 29 year old, left sided centre back. An integral part of the Bath City side that has recently won promotion to the Blue Square Premier. Chris is re-locating to the Southampton area, and is an exceptional player at BSS level. Formerly with Team Bath, Bristol City and Exeter City. Jamie Slabber - 25 years old, 6'2" Centre Forward. Jamie has joined us from Woking having previously played at Havant & Waterlooville, Grays Athletic, Aldershot & Tottenham Hotspur. Jamie has also represented England at under 18 and under 19 level. These two players bring experience and undoubted ability to the Club, and will join us from the first day of pre-season training in July. We welcome them both. DAVID MALONE has praised Andy Forbes as the "best non-league footballer I have ever seen." 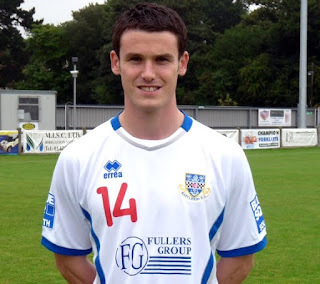 Malone worked with Forbes at Winchester prior to the striker joining Eastleigh six years ago. Malone was saddened to bid farewell to a player who is hailed by many fans as the best player ever to wear a Spitfires shirt. Saluting the striker's statistics of 143 goals in 268 appearances, he said: "No one can argue with Forbesy's record at Eastleigh - or his record as a striker full stop. "We all know that on his day Andy Forbes is unstoppable, the best non-League footballer I've ever seen. "No ones jumping for joy that Forbesy's gone. "Andy acted entirely properly throughout and we did get very close to agreeing a deal for him to stay. DIRECTOR of football Dave Malone is tipping Richard Gillespie as the player to put a smile on the faces of Eastleigh fans next term. Malone shares the supporters’ disappointment over the departure of popular frontman Andy Forbes, who this week signed for Blue Square Bet South rivals Woking. But he reckons the best has yet to come from 25-year-old Gillespie, who was voted players’ player-of-the-year in his first season as a Spitfire. Despite his tender age, Gillespie had earned himself legendary status at his former club Bashley, scoring 173 goals in just over 300 games for the Southern League outfit. Initially it looked as if the step up in standard might be beyond him as he flitted on and off the subs’ bench in an injury-hampered start to the campaign. But his pace and willingness to run the channels and nip behind defenders soon paid dividends, leaving him with a respectable 15 goals in his debut Blue Square South season and 18 in all. ANDY Forbes's six-year love affair with Eastleigh is over following a late change of heart by boss Ian Baird. After a meeting between manager and player last Thursday morning, it was 90 per cent agreed that the Reading-based striker - scorer of 143 goals in 268 Spitfires appearances - would be staying put at the Blue Square Bet South club. But after mulling things over for 24 hours, Baird concluded that, taking his age and the number of games played over the past two seasons into account, re-signing fans' favourite Forbes did not represent value for money. "When I spoke to Forbesy last Thursday, we 90 per cent agreed a deal to sign him on the same money he was on last season," Baird admitted. "But having had a deep think about it for 24 hours, I met (director of football) Dave Malone and explained the reasons why I wasn't going to sign him. "And then I rang Forbesy and told him the same thing. JOMA 2010 SOUTH WEST CHALLENGE CUP TOURNAMENT. FORMAL ANNOUNCEMENT OF TOURNAMENT TEAMS. FIVE MONTHS’ HARD WORK BEARS FRUIT FOR TOURNAMENT ORGANISERS. "At the end of FIVE MONTHS hard and sustained planning, the JOMA 2010 Tournament can now announce the 12 Teams who will compete in July for the South West Challenge Cup; the Executive wants to thank all those host Clubs and local organisations, too numerous to mention, who have assisted in the overall planning of the event to date. "As we enter a new phase of the overall plan, the Executive is completely satisfied that the structure and timetable is now in place to deliver a superbly competitive pre-season Tournament, subject to formal Registration by Devon FA and the appointment of suitably qualified Match Officials." Tony Taggart yesterday signed a deal with Blue Square South winners Newport County; joining Eastleigh goal-scoring legend Andy Forbes out of the Silverlake Stadium exit door. Ian Baird brought Taggart to Eastleigh in the summer of 2008 from his former club Havant & Waterlooville. Tony became indispensable for Eastleigh almost instantly and proved to be a quality signing. It was by no coincidence that the club's best league campaign in the Blue Square South in 2008/09 (narrowly missing out on promotion), just so happened to be the year that 'Taggs' became a Spitfire. A virtual ever-present under Baird, Taggart played a key role in the push for promotion making 45 starting appearances and finishing the season as top goal scorer with 15 strikes to his name from his wide midfield position. It was an outstanding debut campaign for Tony in 2008/2009. ANOTHER of last season's 'relegated' clubs from the Blue Square South could be in line for a reprieve. If Salisbury City are, as feared, demoted two divisions from the BS Premier because of their failure to comply with the Football Conference's controversial Appendix E*, Forest Green Rovers are in line to remain in the Conference National. And that in turn could signal a reprieve for serial escape artists Weston-Super-Mare who finished second to bottom of the Blue Square South. Worcester City, who came third to bottom, have already been let off the hook. Farsley Celtic and Chester City going out of business, coupled with Grays Athletic dropping out of the Conference structure and Northwich Victoria being kicked out for a breach of rules, left an imbalance. Subsequently Worcester were spared relegation, but the Midland outfit have been switched across to the Blue Square Bet North. A month after the 2009/10 season drew to a conclusion, where the Spitfires finished 12 points adrift of the playoff places to claim a mid-table finish; Eastleigh's preparations for the new campaign is well under way. Director of Football Dave Malone released the following statement on the club's messageboard. "We are now close to completing our squad for next season. "As two players we have agreed terms with are not free agents until June 1st - we can not confirm their signings until after that date. We can assure you that they are both established players, at BSS level (and above!). "In contrast, we have not retained Ian Oliver and Andy Forbes - we would thank both players for their contribution to the Club, and wish them well for the future. "We are still negotiating with a small number of players - but hope to conclude our squad in the very near future. Former Eastleigh starlet Aaron Martin, who completed a dream move to Southampton in November 2009 from the Spitfires, has enjoyed a taste of first team action in recent weeks for the Saints. It was great to see the 20-year-old centre back make a strong impression on his debut against Gillingham recently and then to witness Aaron turning in an equally impressive home debut in a 3-1 victory over Southend at the weekend. Keep up the good work Aaron, we have most definitely missed your undoubted ability in defence at the Silverlake Stadium since you moved on. Supporter of the Year: "Broomer"
Spectators of the Year! : Jamie Brown and Andy Forbes! SUTTON United's former Eastleigh boss Paul Doswell has confirmed his interest in the Spitfires' out of contract striker Andy Forbes. It was Doswell who originally took Forbes to the Silverlake Stadium from Winchester City in August 2004, since when the 30-year-old hotshot has scored 143 goals in 268 appearances for the Blue Square South club. Forbes, though has had a brittle relationship with current Eastleigh boss Ian Baird which came to a head in November when he was transfer-listed. He was later taken off the list after convincing Baird of his hunger to remain at the Silverlake. But, with his contract now at an end and Eastleigh offering reduced terms for next season, it looks as if he will be moving on. Doswell, who has spoken to Forbes, said: "I can confirm my interest. "Nothing's been signed, sealed or delivered, but Andy's someone I signed in the first place and I still consider him to one of the best strikers around.